Aladdin is one of my favorite Disney movies (making Jasmine one of my favorite Princesses) but I’ve been disappointed that she hasn’t appeared in more than one Lego Princesses set. Well, this year she gets to be in a couple, likely hoping to capitalize on the live action Aladdin movie coming out. The biggest one of the Palace Adventure, so I picked that up. It’s $29.99 with 193 pieces. The main draw is the characters. 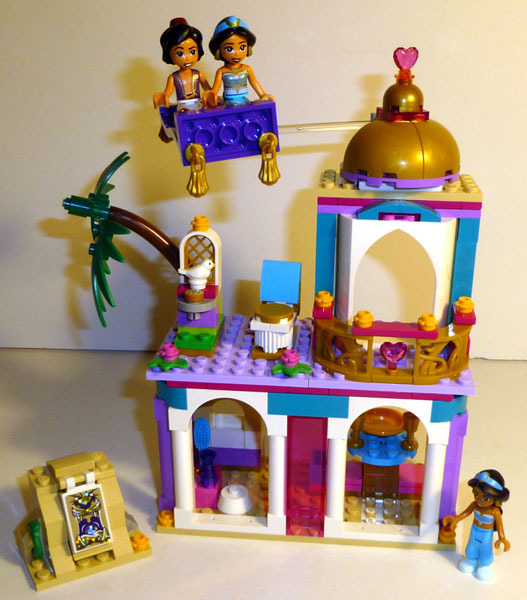 Jasmine has appeared in one set before as a minidoll (included in the picture in the lower right). In this set, she gets some printed upgrades on her pants, torso, and face, and I like the details. It looks like her hairpiece is unchanged. Aladdin appeared once in the Disney CMFs, so this is his first appearance as a minidoll, and the details totally fit the character. I think they also reuse his hairpiece, but the rest of the printing is new. We also get the magic carpet; it was included in the Jasmine set as a simple build, but it’s a bit more detailed here. It uses a wavy wall with a decent sticker on it showcasing all the details. (Sadly, it’s not visible in my picture, and I didn’t quite get the sticker on straight, but it still looks great.) The bigger deal is the use of the gold tassels, which are a major part of the character. In theory, there is room for both characters to ride on the carpet, but minidolls aren’t really built to sit side by side like that. I added some studs to Aladdin’s feat, pushing him back just enough so their arms aren’t colliding, so it kind of works, but I think the set just wants you to use one character at a time. There are some interesting parts, including some lavenders, golds, tans, magentas, and teals (although those aren’t quite the colors I picture when I think of the palace from the movie.) Some of the big white / lavender wall / window pieces are fairly new, and it could be useful for some builders. Some of the rare or exclusive parts include the teal 1x1x5 brick, teal 2x2 round corner brick, teal 1x4 arch, lavender 8x8 plate, magenta 1x4 tile with 2 nobs, medium lavender doorway, medium lavender 6x6 round plate, purple wavy wall, gold 3x3x2 arch, gold 3x3x2 fence, and the new white bird piece. The build is. . . well, basic. The Lego Princess builds have never been anything to really call home about. You build two levels with some furniture and accessories on each. On the bottom level there’s a table with some seats, as well as a market stall. The top includes the balcony section with a domed room, and them a small patio with a chair, birdbath, and small tree. The big action feature is that the dome is built on a swivel and had a beam that can attach to the flying carpet, so you can spin it around and have the characters fly over the palace. I like this bit. There’s also a small Cave of Wonders build included, with a hidden compartment for the golden lamp, and a sticker with the Genie on it. The set comes with a lot of sparkly stickers, but I only included about half of them. One feature that I wasn’t aware of until I read the instruction was that all the Disney Princess rooms this year are semi-modular. 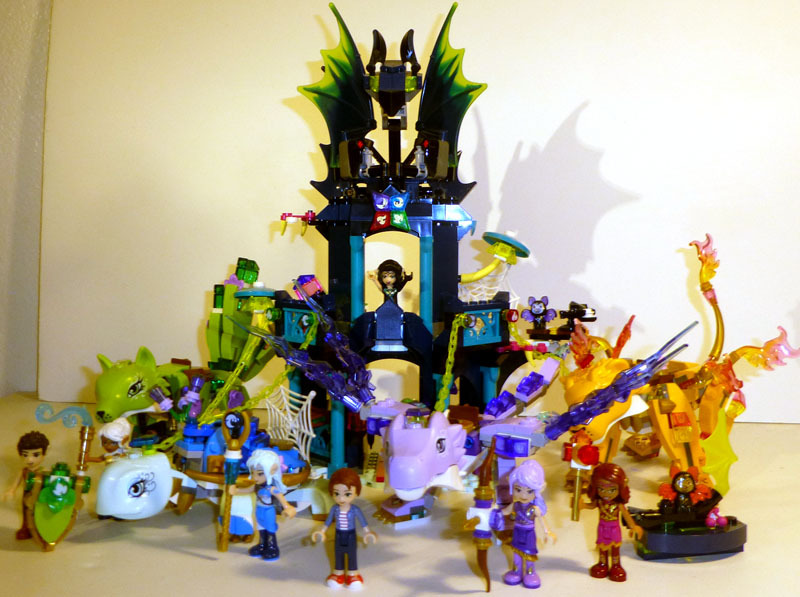 You can mix and match them together, and the example picture shows that you can create quite the impressive Disney Castle when you combine most of the sets. I obviously can’t do this because I haven’t bought any of the others (and don’t plan to) but it’s a neat idea and gives the infectious “collect them all” mentality to this line of sets too. It should be fairly obvious that I have an obsession with collecting figs, and when I heard that stores in my area were releasing them early, I kinda jumped on it. The first store I visited didn’t have any, but the second one had a small selection, and I was able to grab 9 of the ones I wanted. First I want to address the bag issues. It was rumored that these figs were going to be double bagged like the UniKitty figs, which makes it difficult to tell them apart. But based on my selection, not all of them were double bagged, and there wasn’t some obvious reason why some were and some weren’t. Luckily, the man packaging changed, and it’s actually a bit thinner than the old CMF bags (which were starting to get tough to rip open by hand.) From my experience, the second bags do make it more difficult to identify the pieces, but it’s not as bad as I thought, and some parts are included outside the second bag. (Kitty Pop and the Cowardly Lion both had their tail pieces floating out in the bag, and the Crayon Girl’s crayon suit was totally out on it’s own.) So, overall, not the deal breaker I was expecting. Another new thing I noticed were the inclusion of extra parts. 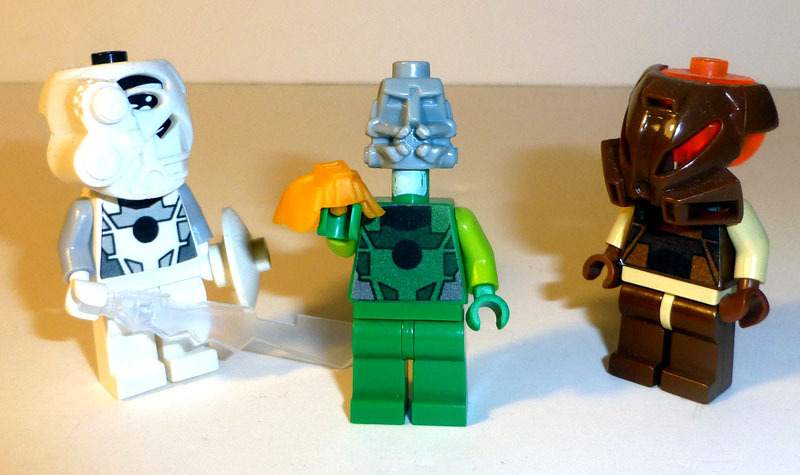 The first three waves of CMFs included extras of the small parts, doubling up per the standard of most Lego sets. 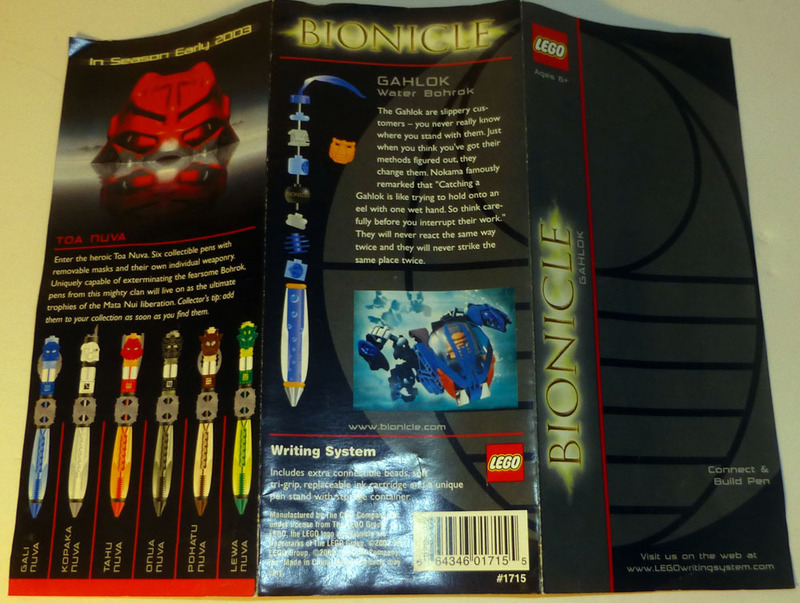 But after series 4, they stingier and stopped including extras of small elements. But that has changed for this group. Both of the pop singers received extra microphones, and the Giraffe Guy got an extra plant. So that’s a neat development. They also come with white baseplates this time around; it’s kind of cool to see each new series getting a new colored baseplate, as I was starting to get too many of the solid black ones! From what I’ve heard, distribution on these is pretty even; of the 20 different types of figs, each ones comes 3 to a box. This means there are no chase figs, but don’t kid yourself in thinking that some will vanish faster than others. I fully expect the Wizard of Oz characters to go quickly, as well as the easy to identify costumed characters. Anyway, below is a quick review of the figs I got and then an even quicker feel guide to the others. Crayon Girl: I like the purple and medium lavender coloring, and the costume piece looks great. It also has a pinhole in the top for hair accessories. Her torso and legs are plane, but the legs are dual molded. (A shame, I really want more straight lavender legs, but they only come with the DVD exclusive batman fig.) She also has two expressions; smiling with eyes opened and closed. To find, feel for the big crayon piece, easy to identify. The rest of her parts were included in a second bag. Giraffe Guy: Honestly, my favorite of the series. The giraffe skin printing on the arms, legs, torso, and neck are excellent. The costumed head piece looks great, and the fig head has two different smiling expressions. Comes with a plant element plus a spare, so plenty of leafs for him to eat. To find, feel for the long giraffe head, which will have the distinct ears and horns on the top. Watermelon Dude: Another neat food design, and you totally know there’s going to be a pizza guy down the line using the same mold. The printing is great, and you get an extra 1x1 corner watermelon slice tile too. Face has two expressions with and without sunglasses. To find, feel for the giant watermelon wedge. Sherry Scratchen-Post & Scarfield: A fun remake of an original Lego Movie character. Sherry has a lot of cool armor printing, including a metal cat head buckle. She’s nice, but also similar to the other Apocalypseburg characters released in the other sets. That said, Scarfield features a cat mold with a new Mohawk; what’s not to like? She’s a trickier one to feel for; either identify the cat or her large hairpiece. Dorothy and Toto: It’s about time they made the rest of the Wizard of Oz cast, since we also saw the characters rendered in Lego Dimensions years ago. Dorothy has some nice printing, a skirt, a happy and concerned expression, and a new hairpiece, and Toto makes a good reuse of the dog element. Plus, she has her ruby slippers printed on. Her pieces came in a secondary bag, but feeling for the rubbery hair piece is a good bet. Cowardly Lion: He looks pretty good with a dark flesh color scheme. The mane element is nicely done (and way better than the lion heads we got in Legends of Chima) and he has nice subtle printing on his torso and legs, as well as a tail element. The head is a shade lighter (regular flesh color in Bricklink?) and has two expressions that fit his character: happy and sad. He also has a trans clear 1x2 tile with a metal printed on it, to show off his courage. His parts (minus the tail) are double bagged, and the mane piece isn’t exactly easy to identify. While the tail piece and 1x2 tile do appear in other figs, he’s the only one who has them together, so that could do the trick. Scarecrow: We’ve had plenty of scarecrow figs before, but this one is movie accurate and comes with a new hat element, as well as a diploma on his 2x2 tile. I honestly mistook his pointy hat for the Tin Man’s, but that is one piece to feel for, as well as the 2x2 tile. 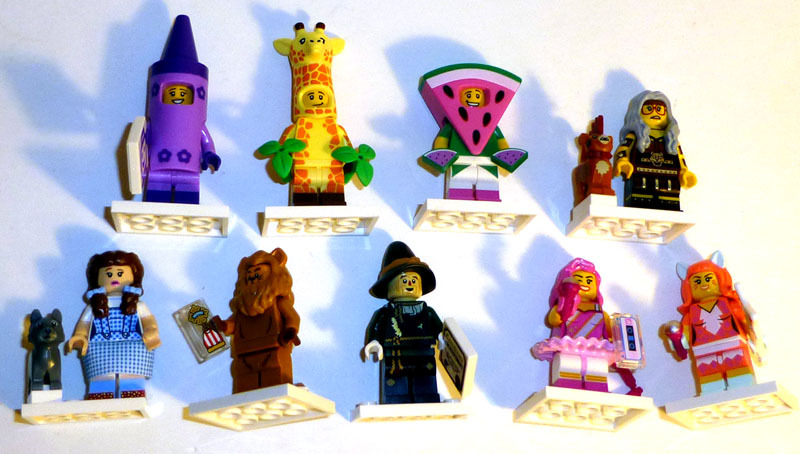 Candy Rapper: I don’t know what her role will be in the Lego Movie 2, but some of the sets hint that there will be some massive dance party, so I’m sure she’s part of the band. She has the tutu skirt, but this time with some neat printing on the top. She has two smiling expressions, including one where she’s winking. The pink hairpiece also has some extra highlights on it, and her accessory is a cassette tape. She also has two pink microphones, so yay for extras. To find, feel for the large tutu skirt piece. Kitty Pop: Her face looks fairly similar to Candy Wrapper, just with extra whiskers, which makes me wonder if this is just one Pop Star character in different outfits. She reuses the cat hair piece in what I believe is the new coral red color, and she also has a tail. Her accessories are a guitar and two pink microphones. Her parts are double bagged, except for the tail piece, but the item to feel for would be the guitar. Tin Man: Feel for the one piece axe or the bowtie. The 1x1 heart piece might be a bit tough to identify on its own. UniKitty: Feel for the 1x3 brick or 1x3 arch. Or identify it as the one character that doesn’t have minifig arms, legs, or head. 2018 has been an interesting year for me for Lego. I generally bought fewer sets compared to the last four years, but my budget was dominated by a couple of large purchases this summer, thus forcing me to hold out on buying a lot of sets in the second half of the year. I’ve also bought a couple of sets that I have yet to open, which is a strategy I haven’t applied before. (Usually I build any set I get soon after purchase. But this year, I bought a few sets exclusively for the pieces, and I want to sort the pieces into my collection directly, but I haven’t gotten to the sorting step yet, so they remain unopened.) Anyway, I thought I’d post a few quick thoughts on the sets I did pick up this year. Ninjago was my biggest theme in 2018, although I wouldn’t say it was the theme’s best year. I collected a bunch of the S.O.G. sets, but I wasn’t particularly impressed by most of the vehicles. (Lloyd’s Nightcrawler wasn’t bad, but Kai’s Katana V11 was generic and Zane and Mr. E’s motorcycles were mostly boring IMO.) The S.O.G. Headquarters is okay for parts and figs, and has a lot of great play features to make up for the lackluster designs. My favorite set from the first wave is the Temple of Resurrection, which is a cool stylized building with nice details and a cool function. Still, it’s only a modest building compared to previous Ninjago structures. Also, because I have become a bit of a Ninja fig completionist, I bought a bunch of the spinner and flyer sets this year, like the Golden Dragon Master. The pieces used to make the handles are okay, but I’m tired of the various spinner and ripcord pieces, which are large and bulky and generally can’t fit into other builds. The exclusive figs aren’t even as cool as some of the previous spinner packs. (I especially liked the crazy elemental designs of the Airjitzu Flyer Ninjas; the Spinjitzu Master Ninjas were boring in comparison.) I honestly wouldn’t recommend them unless you have a specific need for the pieces or the figs. The Infinity War sets also were better than I would’ve expected from the theme. While some of the designs were meh in order to include more figs (Bearded Cap and Blonde Widow in Outrider Dropship Attach, and Shuri in Vorvus Glaive Thresher Attack), some of the designs were quite nice. I didn’t pick it up, but I like the detail they put into the large Sanctum Sanctorum set. 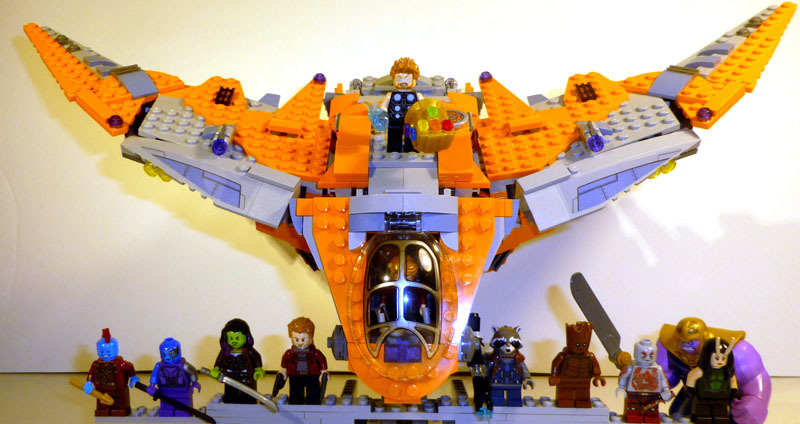 My favorites were the two sets that put together the Guardian’s new orange spaceship. It has a nice sleek design, which is similar to the Milano but still distinct in its own right. The smaller dropship alone is kind of odd, but I appreciate how seamlessly it fits into the back of the main ship. Plus, Thanos and his Infinity Gauntlet is a huge draw, although you need to buy each set to get all the infinity stones. (Or trade them with friends; Chocolate Frogs helped me fill out my gauntlet.) Still, I think they did a good job of making decent sets for this movie, and not just some lame builds to go along with the new figs. Excelsior! Alas, this appears to be the last year of the fun Elves theme. I’ve enjoyed the pastel colors, animal designs, and general collectability of this fantasy theme, even if it involves minidolls instead of minifigures. Luckily, the theme got some decent sets to go out on. The first wave was great, especially since it included some new styles of creature design like the Eagle, the Turtle, and the Fox. I also liked the inclusion of lots of Teal pieces in the various sets. (Apparently, the Elves team played a major role in getting teal reintroduced.) My favorite animal design is the green Earth Fox, and Noctura’s teal and dark blue tower is also another nice highlight to the set. It’s also fun that the Elves got some weaponry this year, which I think may be a first for a minidolls set. (Okay, some Friends sets had crossbows for sport, but I think this is the first wave where the Elves are specifically armed to fight evil.) I haven’t built the final two sets released last summer, but they look pretty good too. I’ll be sad to see this theme go; I hope they’re able to replace it with another cool fantasy theme with the same fun colors and designs. 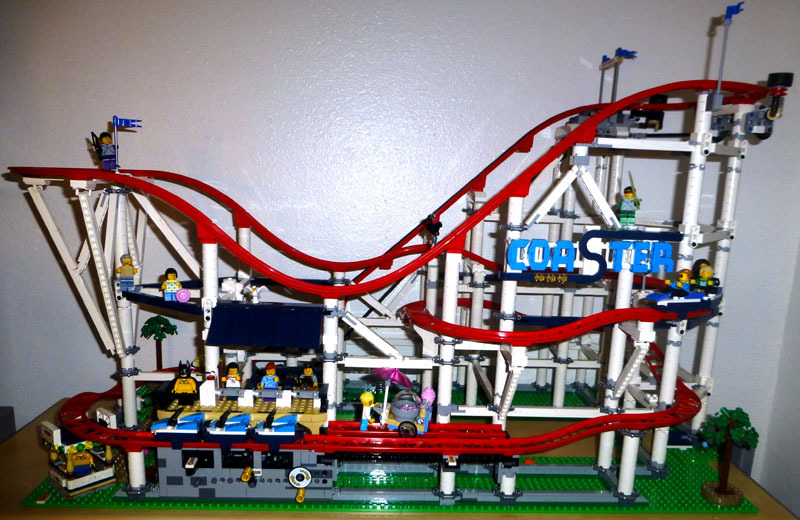 The Roller Coaster is the largest and most expensive Lego set I have ever picked up, which I blogged about four times this summer. It’s a lengthy and tedious build (seriously, I got really tired of building the supports over and over again, and putting together the chain was aggravating.) 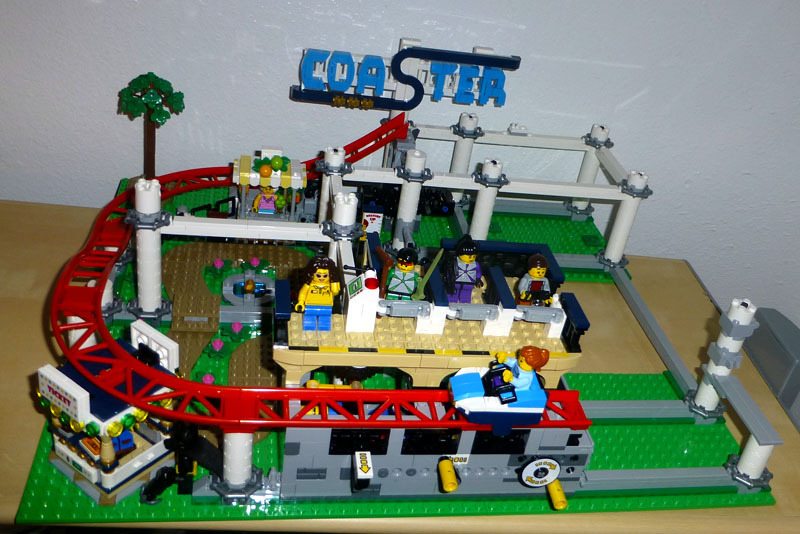 It doesn’t quite have the same level of cool visual designs as Voltron or Ninjago City, but having a fully functional roller coaster is still amazing. I eventually got a motor hooked up to it, and I like to run the carts through a couple of rounds every so often. The set is far from without issue: the fact that the top wheel mechanisms are run by the chain puts a lot of stress on it, and it doesn’t take much for it to jam or snap. There is a braking feature in the dock that doesn’t quite work for me either; a train moving at full speed just pushes through without issue. And while the supports and track make it sturdier than I expected, it’s still fairly flimsy, and a slight nudging in the wrong place can break the track off. 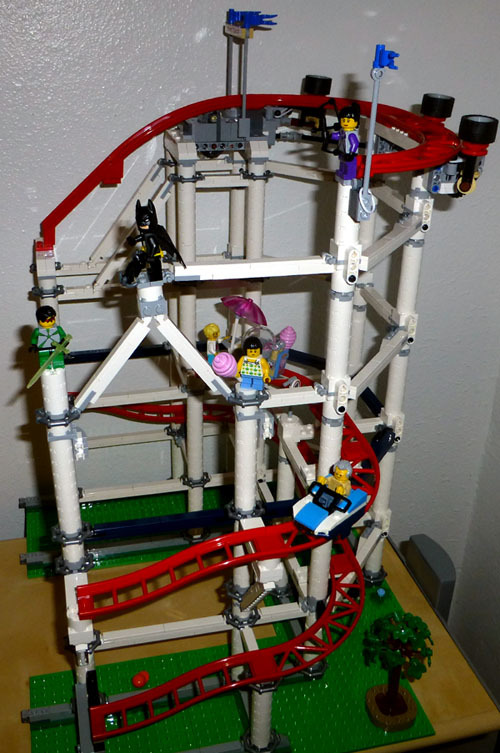 But still, IT’S A FUNCTIONING LEGO ROLLER COASTER!! That generally outweighs a bunch of the issues. Of course, at $379.99 it’s insanely expensive and the primary reason I didn’t get a bunch of other sets this summer; I can see how some people can easily afford this set, but it kinda broke my budget. Still, I could easily claim this to be the best set of the year. I’ve always been a completionist for Collectible Minifigures, but I am starting to get turned off by the licensed waves they keep doing. The second wave of Batman figs was mostly disappointing, although I did like getting some secondary Justice League characters and a few third string villains. Series 18 with the party theme was excellent and had many great costumed characters, and I totally got all of them. The Harry Potter wave was okay but it could’ve included a lot more secondary characters. (As nice as it was to get the cast from Fantastic Beasts, most of them appeared in sets, and new variations of the core Harry Potter characters weren’t exactly required here.) Still, the biggest draw for me were the new medium legs for the teenage students; I hope these style of legs appear more often, and they’re not just a one-off thing like the extra-long legs were for Woody in Toy Story. Because of that, I did end up picking up most of the Harry Potter figs, although I avoided picking up a few. Also a great way to stock up on those new wand pieces. My favorites from the Batman line were some of the Justice Leage characters like Black Canary, Black Vulcan, and the Wonder Twins, although Doctor Phosphorus was appreciated for his trans lime green flame pieces. There were a lot of great costumed characters, but my favorites were Dragon Suit Guy, Cactus Girl, and Race Car Guy. There weren’t a lot of standout favorites in the Harry Potter wave where the main draw was the short legs, but first time appearances for Cho, Dean, and Cedrick were appreciated. I also like Newt and Tina’s updated outfits compared to their Lego Dimension figs. Cho also has the first Ravenclaw torso, but I think that skin color was a bit too dark for her. To be honest, I don’t really have any sets that would fit here based on what I bought. (I mean, there were a lot of sets that I had no desire for this year, but I didn’t pick them up. And also, price level and age range tend to skew things, so while I might not personally like them, I am also probably not the targeted audience.) 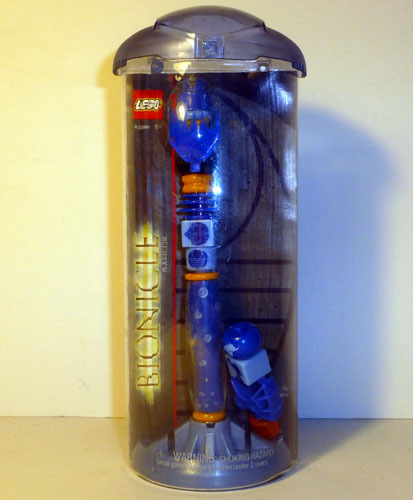 There were some sets that I picked up but haven’t built because the design just doesn’t appeal to me. The Incredibles Great Home Escape has lackluster builds and no real standout pieces, but it is a Juniors set, so I can’t blame it that much, and I only got it for the Dash, Violet, and Jack-Jack figs. Arctic Air Transport is another boring city helicopter, made worse by the fact that I bought a very similar Arctic Helicrane set four years ago. But this one was the cheapest way to get a Sabretooth Tiger, so I grabbed it on sale earlier this year. 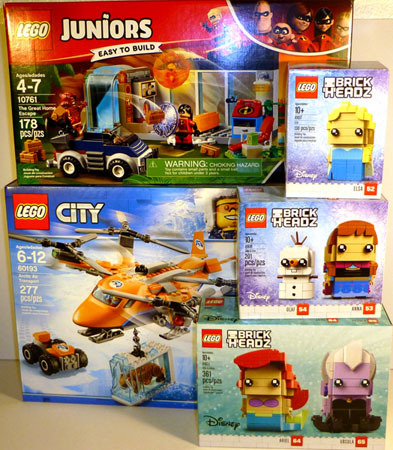 There’s also the plethora of BrickHeadz sets released this year, and I ended up picking up more than a few just for the pieces. (Some of the Disney Princess ones had unusually good parts selections.) And, as mentioned earlier, the various Ninjago Spinners are pretty lousy sets too. Anyway, that’s it for 2018. Honestly I hope I can cut back my spending for 2019, because I can’t afford another Roller Coaster / Voltron summer with my budget! The 2019 Ninjago theme looks fun, but I’m not quite as impressed with all the Lego Movie 2 sets, so at least I won’t be motivated to buy all of those. (Still, Emmet’s House Rocket Ship looks appealing, and I am a sucker for the new color introduced in the party bus.) I’m also interested in some of the Overwatch and Disney Aladdin sets, but so far nothing that’ll break the bank! Still, the year’s still young, so I could very well end up broke by this time next year. Piece wise, there's a decent selection of tan elements that go into decorating the handle, including some slopes, a wedge plate (sadly only two of one side), and various other plates. Then there are some elements in black, but nothing noteworthy. You do get some new "flyer" pieces. The core that the fig sits in now has a longer step, to which the wings are attached via two other specialized pieces that wedge in the plastic wings. Neither of these pieces have standard System or technic connection points (at least that I could see) making them kinda worthless to a MOCer. Meanwhile, I believe we return to the original propeller piece again as the spinner. 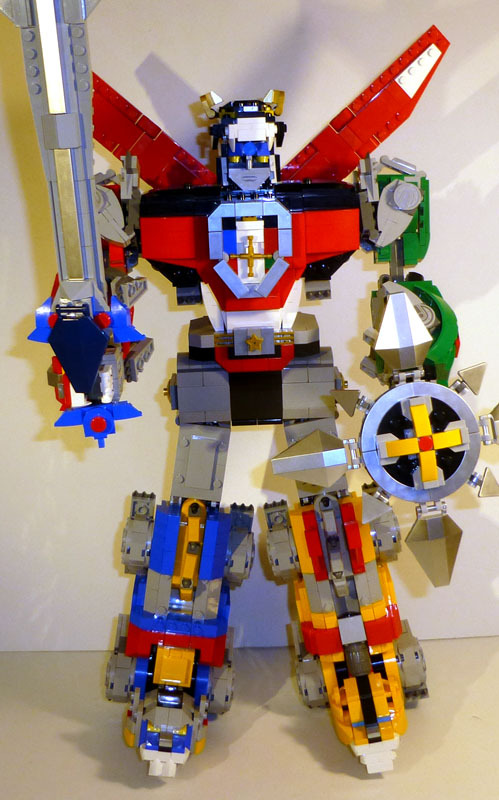 I mean, I'm not nessessarily against Lego release big bulky elements, but it would be nice if they could connect to other pieces. At least the cool dome piece has rod connections. The minifigure is of the new Golden Dragon character. Who is he? A new character, or perhaps one of the Ninjas leveled up? Or perhaps another well developed character who they're trying not to reveal is special at first but it becomes increasingly obvious who it's actually suppose to be as the sets come out... by which I mean, we may never know. (Until the show comes out, obviously.) Anyway, he has a cool gold and white color scheme, and the various strap designs do look like he's preparing to strap into a flying vehicle. It might be a mighty expensive way to get this set of figs, but gosh they look nice. The actual build is a handle that launches the spinner, similar to the last... three?... times they've made these spinner sets. This handle is a bit more complex, with the angled plates creating a bend to make it feel more like... a gun? 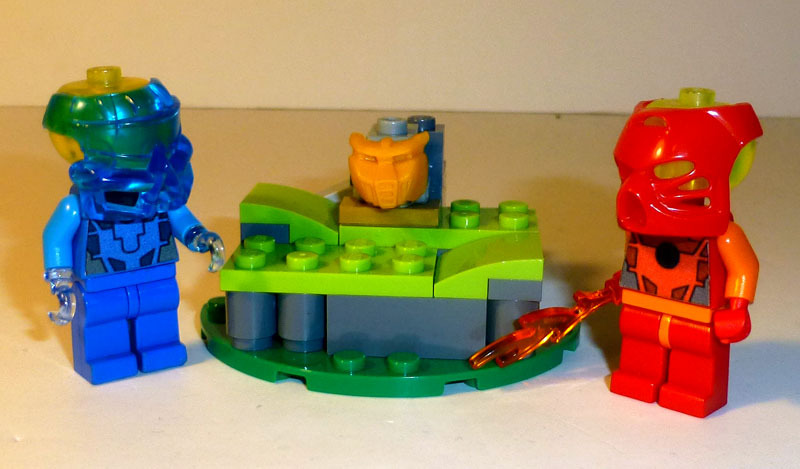 Really, these sets are Ninjago guns, aren't they? Anyway, you can fit the spinner in, adjust the angle, and let it rip! 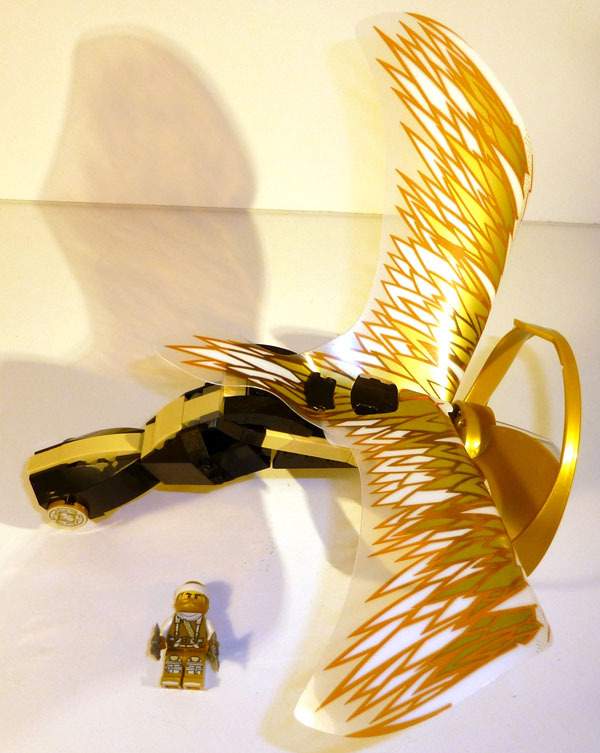 The wings are supposed to help it glide, with the actual spinner acting as a propeller rather than a rhotuka. And it... kind of works. But for mine, the full contraption is just too heavy, so it just glides slowly for about five feet. This feels a bit sluggish compared to the other flying spinners, which could get some legitimate distance. On one hand, these feels more controlled, but the control can also be seen as boring. Or perhaps I am not the target audience and will be scrapping this for the pieces instead of playing with it. Hmm. So yeah, there are some pluses here. The handle has a couple of useful elements (and also a new 2x2 circular tile with the dragon master symbol printed on it, those are always neat.) The plastic wings don't exactly have a system compatible gap, but I'm sure they could be used in MOCs, and they have a neat design on them. The rest of the spinner parts... I'm going to need to buy a bin just for these junk specialized spinner parts. Maybe there's some connection points I'm not seeing. Bag 11 continues by connecting the two halves together and then building a bunch of supports to really lock them in. I suppose it would still be easily to separate them with a little dismantling, but they do get locked together pretty well. 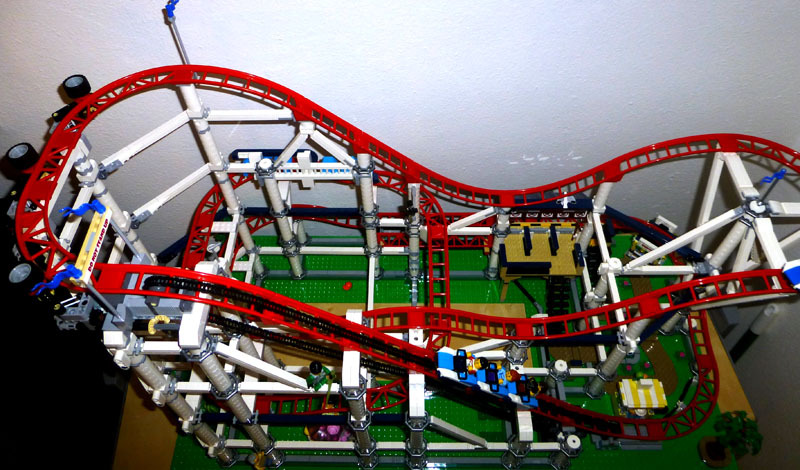 You also build the double track contraption, which allows you to store a second train (or slide it out to add the carts to the track in the first place.) You also put together the six carts and… the chain. The small chain links have been around before (for a while, I was having trouble finding them because they were relatively rare, only appearing in the occasional Technic set) but I believe that this is most that ever appear in one set. There are 203+ of these that you need to individually link together… the process maybe took me 10 - 15 minutes and was far more tedious than building all the columns. But you know what they say about the weakest link. Getting the extra-long chain in place is another troublesome hassle. Basically, you need to feed the chain through the various holding mechanisms, but some of them are difficult to access behind the support beams. (Especially if your hands are somewhat clumsy like mine.) There is a rubber band powered stopper that’s supposed to cut down on the slack of the chain… but it works only moderately well. My chain also catches a lot when I use it to drag up the trains; perhaps there are some pieces that are not flush, but I notice the chain tends to wobble a bit and not remain central along the track, so I may also need to adjust the length. But I’m careful about putting too much force on the lever when rotating the chain; I’ve had it break twice already, and to fix it you basically need to rethread the entire system. It’s a bit disappointing that the wheels on the top of the curve are basically powered by the chain, which I think adds extra stress to the chain. It might’ve been better to build a separate system that goes up the columns and spins those wheels without relying on the chain, but that would’ve complicated things and wouldn’t be as intuitive as just having one system that powers the whole thing. I haven’t attached my motor in yet, so I don’t know how problematic that would be to have the chain in constant motion. I fear the trains would get caught on something, the motor wouldn’t relax on the stress like I’ve been doing by hand, and then the chain would snap and I’d have to put together the whole system again. Oh, and also I haven’t been able to get the braking system to work; the carts blows through so quickly that it just pushes past the wheel if it’s extended. The only way it works is if I’m manually pulling it out, and I don’t think that’s the intention. So while the lift mechanism is less than desirably... once that train starts dipping down the track, it moves along quite smoothly. And it’s awesome and totally worth the giant set... well, mostly worth it. Basically, it’s the same kind of mesmerizing movement out of a Lego set that I’m used to seeing in Great Ball Contraption, which has always been something that I’ve never felt qualified to build for. But motors today are far cheaper than they were ten years ago (and I also earn more money) so it’s always a possibility for the future. The final product is actually sturdier than I would’ve expected. While the individual beams and columns are still wiggly (the far left tower in particular) the inclusion of the tracks actually help lock everything in more than I was expecting. And it’s strong enough that you can lift the whole thing by grabbing onto particular sections (or just the baseplates.) All together, it’s not that heavy, since there’s a lot of opened space between all the bricks. So, despite taking up twice as much shelf space as the Ferris Wheel, I’d say they weigh about the same. I might put together a short video review showing off the set in action, but honestly I don’t have the setup to make it any good; I barely have the shelf space for this! Edit: I've tweaked the chain and added the motor, and it seems to be working alright. Yeah, I skipped a night, sue me. And then sue me for this... SMOKE BOMB! Today I got through bags 6 - 9. 6 build the base, 7 added more columns (ugh), 8 added the ticket and fruit stands, and 9 built the gearbox beneath the loading zone. Overall, I've probably put in 5-6 hours of build time into this, but splitting this up across multiple days does make it seem like a less monumental task. (I have two bags left to go, so I'd estimate another hour and half of building time left.) It's going a little faster than Ninjago City, which has more small pieces to put together, despite costing less. But it's taking longer than the Ferris Wheel, which I believe I pulled off in a single 6 hour sitting. The building here is honestly less enjoyable than Ninjago City. That model had clever building techniques crammed in in every available space. The Roller Coaster, instead, is built more for functionality, so while there are some interesting designs, there's a lot of repetition required for structural integrity. I did include the "Coaster" sign in the picture since I built in with this batch, and it has been one of the more clever designs; I like how they created the letters in a new style. That said, there are a few nifty builds on this half of the track. There's a little path leading to the ride's entrance and exit, and reminds me of the meandering queue lines I used to build in Roller Coaster Tycoon (man, that was an older game that I played way too much.) Funnily, the path forms a loot on the interior of the plate; I get that people are supposed to enter and exit on either end of the ticket stand, but there's not much room there and no colored plates, so I just image that some riders are forced into a constant loop of riding over and over again. Anyway, some of the little details include a small pond, another tree, a fruit stand, and a ticket / photo booth. The latter is impressively fitted on a single stud, but the clips on the top attach it to the curved track and hold it in place nicely. There are also a couple of technic contraptions built here. The first is the mechanism for the chain lift on the far end, which includes various gears and a neat wedge that looks like it will pull out any slack on the lift chain. (Not looking forward to putting together those links, and that's one of the very last steps too.) Even more complicated is the gearbox beneath the loading platform, which has a few interesting placements for the gears. The far right lever reaches across the baseplate and it used to manually work the lift chain, for those who forgo buying a motor. The bar on the far left is the break; it pulls in a time that's supposed to stop the cars at the loading dock. The middle lever then spins that wheel, allowing you to "start" the ride. Meanwhile, the bar can be pushed back so that the cars don't stop when the ride is going fully automatic when you plug the motor in. However... at this stage, the bar doesn't like being pulled out far enough to catch the cars. I've double-checked the build and it's all correct, and I don't think there's anything else added to this later that makes it more effective... so I dunno. It would be lame if you have to manually pull it out to catch the cars as the zoom into the station. This set doesn't have any new figs until Bag 8, so I guess they decided against dispersing the figs equally. In Bag 8, you get an employee to man the ticket counter and other to work the fruit stand. Bag 9 offers you the ride operator and two riders. There are a few rare parts, like the white female hairpiece and the long brown female hairpiece. Two employees get a fancy yellow jacket to show that they're ride operators, so that's fancy. As for new pieces, you get a few nice curved tiles in light yellow with the fruit stand, and also the 2x2 triangle tiles used beneath the ticket stand, the latter of which I can see being very useful. The gold roller skates, Ninjago City ornate fences, and BrickHeadz glasses are also nice to have. There's also the new rock element, which is modestly rare too, and it's my first chance at getting this piece. One thing that I've started to notice about this set is that it's skimping on the extra pieces. Normally, when a bag contains a small element, it includes an extra of it. But then you have sets like Ninjago City, which reuse the same small element multiple times across multiple bags, so you essentially get an extra of the piece for every bag it shows up in. Well, this set doesn't appear to do that for me; I'm getting an extra of the small elements in the first bag they appear in, but if they show up again later (like the white 1x1 plates) the extra doesn't show up. And that's not the only penny-pinching this set does; it asks you to save a rubber band from one bag to use later on in the build. I swear they use to just include an extra rubber band later on instead of this whole "remember to use this rubber band a hundred steps from now" deal. I wonder if this was a conscious decision on their part to limit the number of extras... I mean, is sparing a couple of 1x1 studs really that big deal when the set is already costing $379.99? The running tally for this set is just at $0.09 per part... but that also includes 280 of those small links, so that bloats up the part count, and then you have the specialized track parts that probably cost more. But... come on, this is not a licensed set and is already uber expensive, there's no need to get cheapskate-y. Anyway, I have more column builds to look forward to. And there's also putting together all those links. 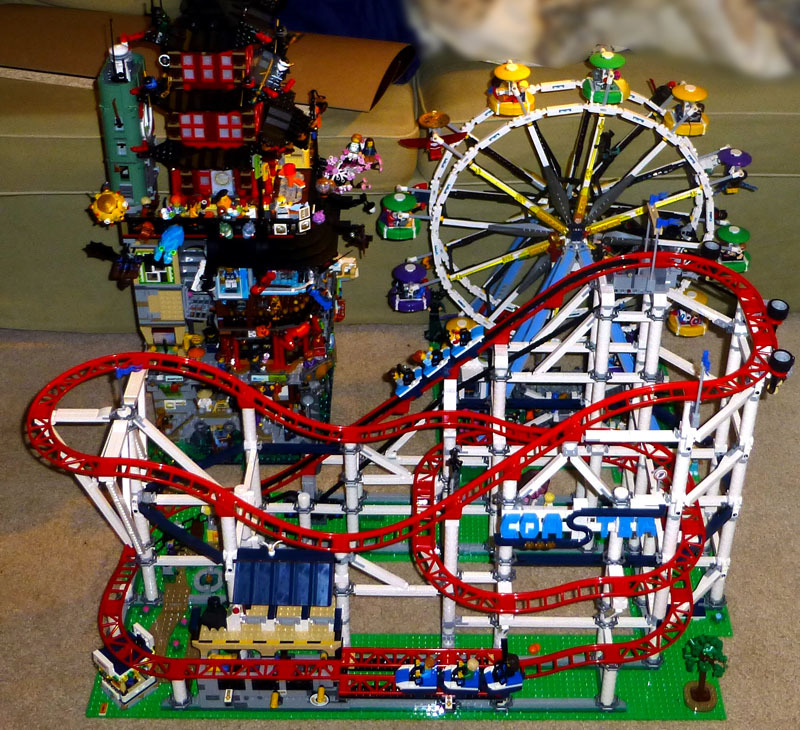 Still, although the build is less enjoyable than some sets, I'm eager to finish it and start playing with a motorized Roller Coaster! The car's been fun to test out on the track, but it still needs to go the full loop! So tonight I finished bags 3 - 5. Well, mostly; I left out the sign bit to do later, and I jumped to the end to build one of the cars (literally the last bits you build for this set.) But in general, the right half of the Roller Coaster is finished. The build was tedious, to say the least. If I wasn't building more columns (which had enough slight variations that I had to pay attention to each one) then I was building one of the supports. The whole thing is modestly sturdy; I wouldn't bet on any stress tests, but it'll hold it's weight for the most part. The most precarious design is the angled bits on the front (where Batman's standing) which is essentially a base for the tracks being held up by two clipped support beams, which is currently not sturdy at all. (But upon closer inspection I realize the sign bit would lock the bases of the two angled beams, thus creating a full triangle.) So it would probably be sturdier if I accurately followed the instructions. There was a bit of technic building on the top, consisting of the gearbox for the top of the chain and the wheels that pull the cars around the top curve. A few clever designs there, but I'm sure nothing a Technic fan hasn't seen before. This is about as tall as the structure will get... and it's tall. It's not quite as high as the Ninjago City tower, but it definitely reaches the top of the third level with the sushi table. There weren't any actual new figs built here, but there were a couple of new pieces I found interesting. One was a 2x3 plate with a bar underneath which has shown up in a few sets, but is new this year. It's not exactly versatile, but I'm sure it'll be useful for some designs. More interesting is the 1x2 curved brick which is not only brand new but exclusive to this set at the moment. (Alas, it only contains two.) This element would be extremely useful, although I didn't test how the curve compares to similar bricks. Hopefully it starts making a wider appearance in cheaper sets, but it has a very specific use in the chain gearbox for the Roller Coaster, thus requiring it's creation, because I don't think any other bricks could pull off the same design. Getting to add in some of the track pieces was fun too, and the little car glides easily down them. Looks like I'm back to building the base tomorrow, but there's the more complicated loading platform to make, as well as a few of the stalls, so hopefully enough to keep me entertained. Although I do get to build the sign; I was saving that for when I'm not burned out; I need a break from building more supports. But anyway, while I get started building this, I'll do a short documentary in my blog. Not a full on review because, well, I don't have THAT kind of time. So Night 1 got me through the first 2 bags (although each number really includes two or three bags a piece, but this is the terminology I use for smaller sets, so I'm sticking with it here.) Basically, it builds the base and first level of supports for the right half of the full set. Now, I thought the Ferris Wheel had some tedious builds, but I have a feeling I'll be sick of constructing all these white columns after a while. That set, the design technique for using clips on the base really holds them together, although the various support beams look like they'll be only partially effective. It's cool how they're using Mixel joints to create some angled beams on the end, but I feel like it's more for show than true support. Seeing at this set is supposed to get three times taller than this, I think the top might be more rickety than I'd prefer, but I'll make that judgment when I get to that point. And one thing that I haven't seen stressed in other reviews is the hazard for pinching yourself while trying to snap these columns together. Maybe it's just due to my hap hazardous building style, but I got pinched a couple of times and actually drew blood once... so now I am being a tad more careful. There are a couple of small builds that fit in with the base. 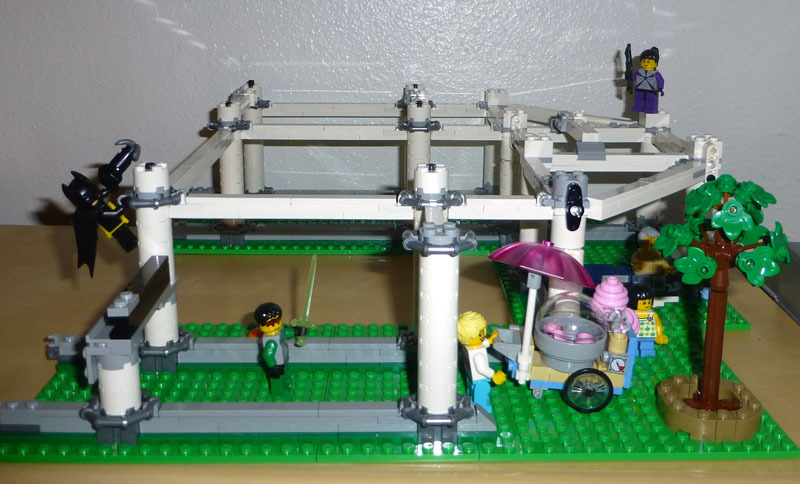 The cotton candy cart is a neat design; nothing super impressive, but it works. (I would've liked to see a gear mechanism to spin the inside of the machine... but how one could pull that off at this scale, I do not know.) The beehive piece as cotton candy (or, as I learned from another British review, is called candy floss in the UK and fairy floss in Australia) is quite ingenious, and I'm kind of disappointed that I only get two of them here. The tree is another nice design for it's size. It's simplistic but manages to work, mostly thanks to various newish plant molds. Even the park bench (not quite visible in the photo) is a neat design, using a new spoiler element to build the backrest. As for the figs... well, let's be honest, these theme park sets just create a bunch of standard city figs, which are useful but not exactly a reason to get these sets. The first bag includes a young girl (too small to ride the coaster, unfortunately), a cotton candy vendor, and a grandpa. The vendor's blonde hairpiece is new, I believe, but not exclusive. I guess points could be had since this set actually includes more female characters, which is a trend not often found in Lego sets. (Six ladies to five men.) 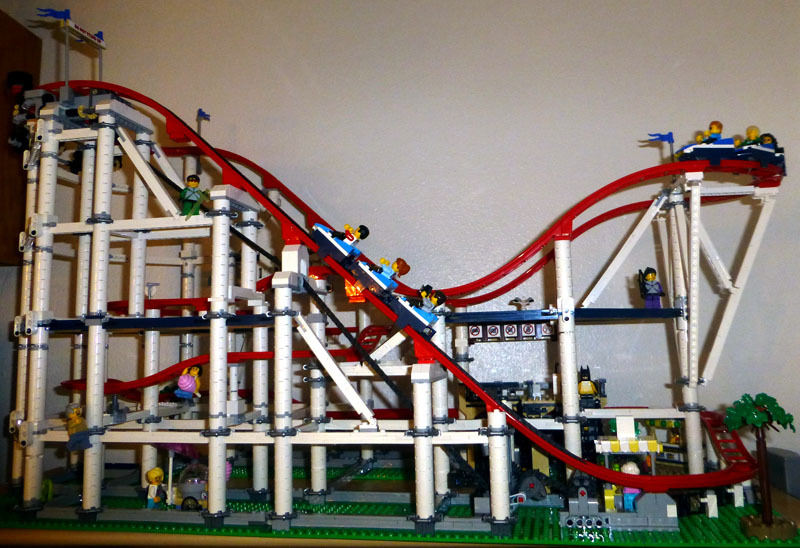 Honestly, I'm going to use this Roller Coaster to display some of my more unique figs. Since the Marvel characters have taken over my Ferris Wheel, I'm thinking the Roller Coaster will go to DC, and Batman's already swinging in to claim his spot! It seems like the standard pen case for the Lego pens at the turn of the millennium. (Although I guess it's missing the plastic backing that would hold the spare beads on display.) A cool design bit is that the top is somewhat shaped like a Bohrok faceplate. You get 11 beads plus the mini krana. The cooler beads, IMO, are the printed ones. 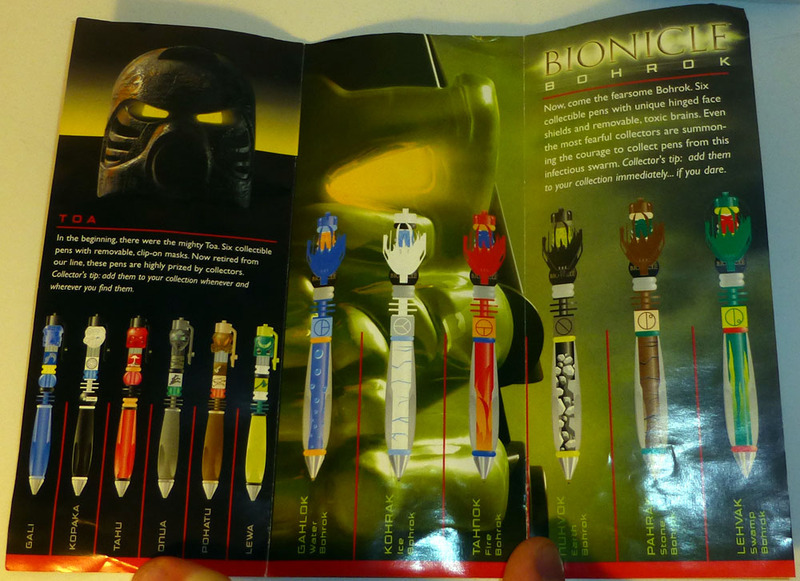 The giant black one with the Bionicle logo appears in all the Bionicle pens, as far as I can tell, but it's still a decent design. Then you've got some medium blue beads with the Bohrok symbol, Gahlok shield, and a silhouette of the Gahlok Va. Then there's a blue bead that has an outline of the Mata Nui island on one side, and the name spelt out on the other. The rest of the beads are generic filler, including a blue, orange, trans orange, and thin medium blue bead (the latter of which it still on the bar in the image above.) 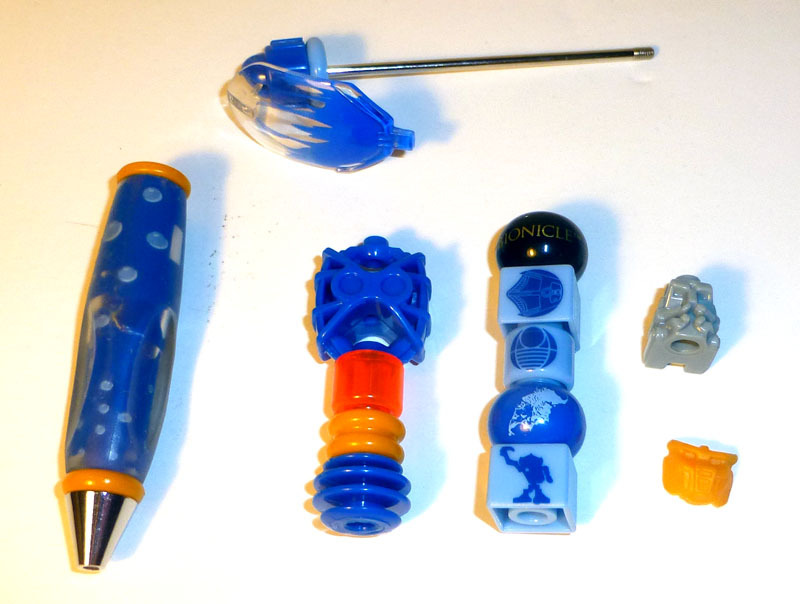 The last large bead is actually molded after the Bohrok limb piece, which is clever. Of course, the beads are largely superficial decorations. Yes, they do roughly fit onto a system stud, but there's no real practical MOC use out of them. Instead, everybody's interested in the krana and the head bead it attaches to. The krana is a hard plastic orange Krana Yo (the tunneling mole krana, for those who haven't memorized the powers). It has a small pin connection that fits exclusively into the mouth of the head bead. 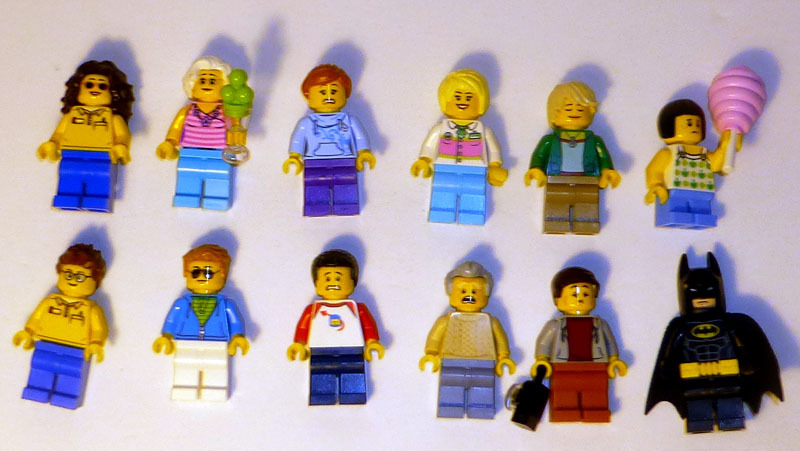 It is too small to fit into a traditional system bar hole, but too large to fit into the small accessory holes seen in minifigure hairpieces. Basically, it's useless without the head bead to attach to. And the attachment is weak... I don't know if that has to do with age or not, but the clutch power is barely there. It's not to say the head bead is completely worthless. 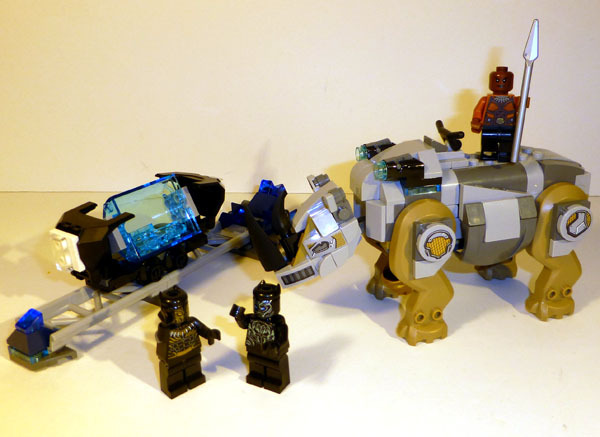 It attaches firmly to a stud, so it would actually work nicely to incorporate a small krana into a system MOC. 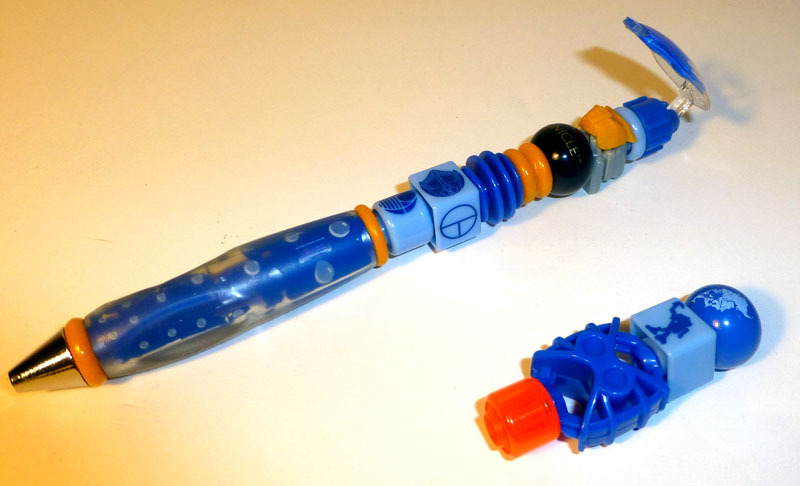 There's potential... but not enough for me to go and track down the other five Bohrok pens. 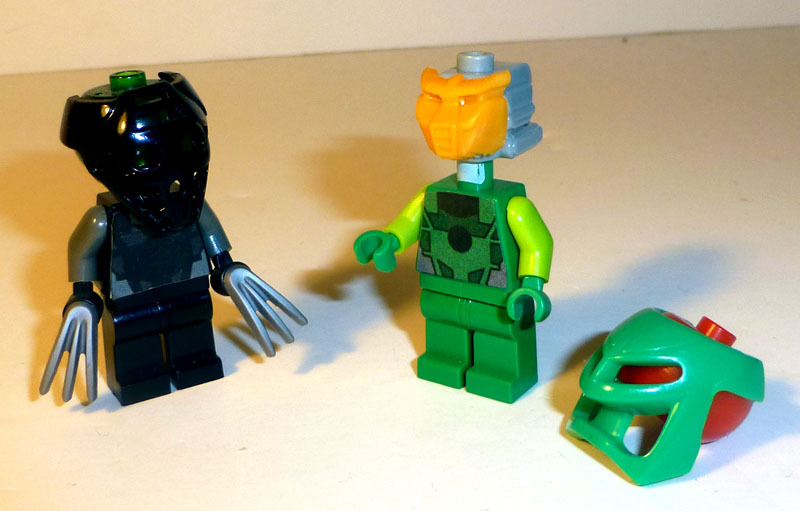 Unfortunately, it looks like the Toa Nuva pens also have unique masks that clip to the same head bead, which means that making Toa Nuva minifigures using the pen masks does not seem like a feasible project either, even if the pens were moderately affordable. So the pen is only sorta meh, and the beads and krana aren't quite as worthy as the Toa Mata pen masks. There's a nice nostalgia kick for those of us who grew up in the Bohrok saga, but honestly it's not a must-have collectible.